Is Free Range Parenting for You? Do you know what free range parenting is? I will discuss the theory itself as well as the pros and cons of this parenting style. 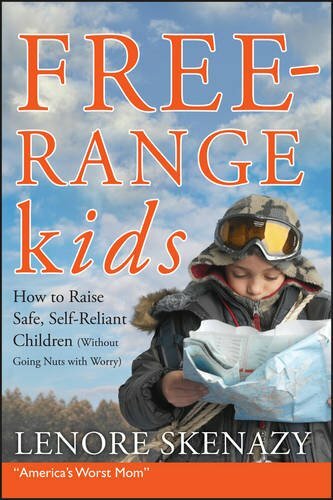 The FreeRange movement is essentially a nostalgic throwback to 100 years ago when children had more practical responsibilities, more time alone in independent tasks, less structure, and more freedom to do things such as walking alone to school. Free range parents fight the notion that kids are constantly in danger, whether from cars, creeps, germs, or low test grades. They believe that kids should be allowed to experience risks on their own and explore the world without constant fear. I view it as the opposite of helicopter parenting. Free range parents believe they are letting the children explore at their own pace, in their own way. Helicopter parents monitor their children’s activities, and structure their lives. They believe that it enriches their development and keeps them safe. A free range parent once famously blogged about allowing their 8-year old to ride a subway on a regular basis by themselves. A hallmark of the parenting style, advocates are quick to point out that walking to the store, walking to school, or even taking public transportation alone used to be perfectly acceptable. In fact, in some parts of the world it still is today! The freedom to roam also extends to just being in the house without the parent hovering over their play. Allowing the child to find their own activities and forcing them to entertain themselves is said to encourage creativity and self-reliance. The free range movement also has strong views on America’s educational system. Instead of constant testing and grades, advocates believe the environment should nurture the children to be inquisitive and learn through doing on their own. Learning should be interactive and have less structure in order to engage the child fully. It promotes tactile learning, like that you would receive in Boy or Girl Scouts. There are many private schools geared towards this learning style. They have the nickname “Forest Kindergartens”. Proponents point out that educational systems more successful than ours, such as Finland, use many elements of this theory in their public schools. - It allows the child to understand risks. By taking more risks in life (such as walking to school alone), free range parents believe they are teaching their kids to appreciate how much risk is involved in everyday activities, leading to a less anxious and more adaptable adult. - Less parental anxiety. Free range parents also believe that by letting go of the constant supervision and scheduling, family life is improved. - The biggest argument for detractors is that the lack of parental supervision is dangerous. This is true not only in allowing 8 year olds to ride the subway alone, but also walking to school and playing around the house. The younger the child is, the less capable they are of protecting themselves and assessing risk. Without a parent to guide and watch over them, many argue that the child is more likely to be harmed. - The lack of structure can lead to reduced learning opportunities. While almost everyone can agree that the American education system needs a big overhaul, many parents argue that “free range” education limits a child’s exposure to structure and more difficult subjects. How many children actually want to learn algebra? And if a child is not raised in a structured school setting, how prepared will they be to tackle college or a professional job? I think ultimately that balance is the key to anything in life. While I can certainly agree with some of the arguments for Free Range Parenting, I also feel that children have to be given age-appropriate experiences and supervision. I would love it if my toddler could run around the house and I didn’t worry about her . . . but the reality is that she is quick to put anything in her mouth and thinks it is hilarious to corner the dog and cat. If I want to avoid a choking incident or an animal bite, I have to lean towards the helicopter parenting at this stage in development. I simply don’t agree that either risk is part of her discovering the world. I can certainly see my stance changing as she gets older. Check out the book that started it all!